Back in 1939, some folks who enjoyed the Buck Rogers style stories about the future, decided to meet in New York City and revel in the comfort of expressing their enthusiasm in front of and with like-minded strangers. The event, which was later dubbed NYcon, I and was held July 2 to 4 at Caravan Hall with about 200 people attended the historic proceedings. One young Los Angeles enthusiast, who had to borrow the money to make the crosscountry trip, got swept up in the existential aspect of the affair and became determined that he would write and sell similar stories and novels. He eventually expressed that philosophy in a book titled “Zen and the Art of Writing.” That writer is still wrestling with the same old adversary, a blank sheet of typing paper (he still doesn’t use a computer), but these days, marketing his product is much easier. 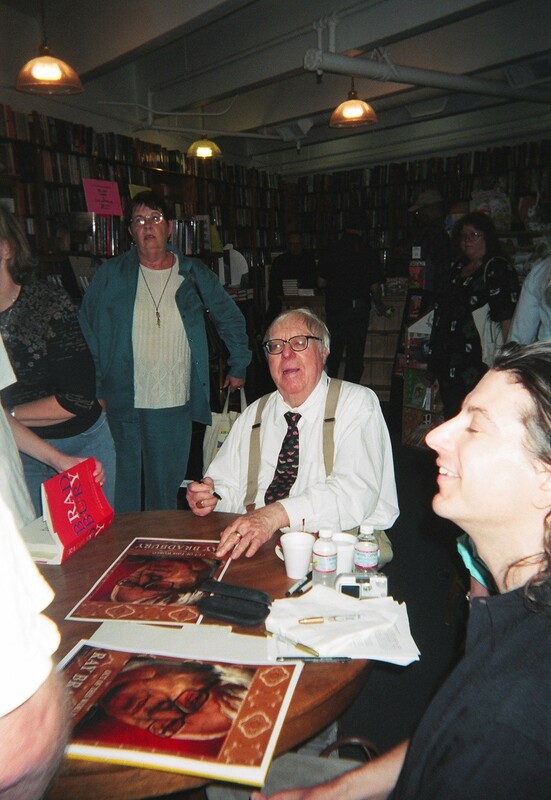 When Ray Bradbury has a book-signing event, the line of enthusiastic customers is quite long. For some folks the process of going to an event, such as a baseball or basketball game, isn’t complete until they read a story in either a newspaper or magazine. For others, who were unable to attend, the journalism is a way for them to participate vicariously. Later, any surviving record (such as a microfilmed newspaper containing the report on the particular event) will be useful to historians, members of academia, and fans who had not yet been born. Journalists, by their very nature, yearn to be present when history unfolds. this columnist, decided to cover the event in the hopes of getting good material to use in the first column for June of 2004. We strongly urged el jefe for Just Above Sunset online magazine to also attend. Other bloggers, such as one of the guys from Acid Logic and a USC student said they were there to learn what to do to increase traffic to their site, and how to do it. Others such as Cecile Dubois, who has her own blog was blogging it live for the moderator’s (who happens to be Cecile’s mom) website. It seems, she would blog and post, blog and post. Others were blogging with a “live feed” aspect. It was the blogging equivalent of TV and radio reporters who provide “on the scene” reports to their audiences. One of the best efforts at transcribing every word seems to have been provided by L.A. Voice. Afterwards some of the sites posted comments about the items covering the event. Charles Johnson did stir the audience up with the information that the name of his website is derived from “a hang gliding accident in Tokyo.” He said the name is purposely ambiguous and is designed to elicit conjecture about its origin. Whenever this columnist hears the name of that particular website he hears the voice of Gracie Slick singing the comment that the little green footballs that mother gives you don’t do anything at all. 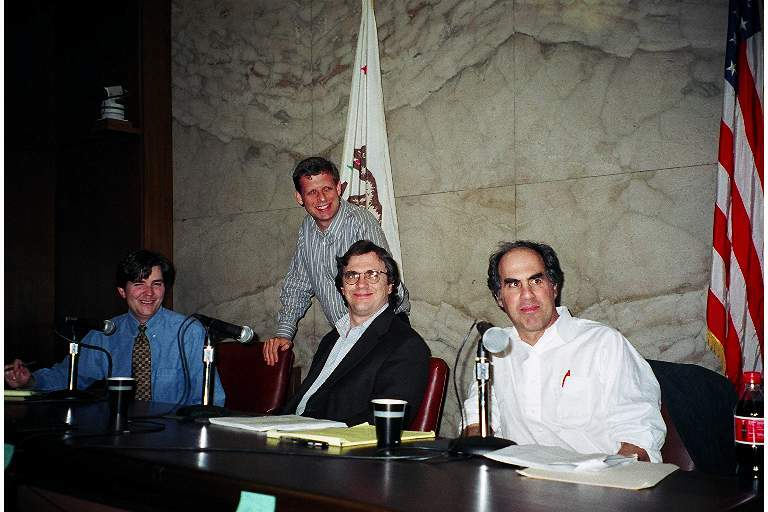 At one point someone got around to mentioning that at a previous point in the history of blogging, Gene Volokh held a seminar (we covered that one too!) where Glenn Reynolds advised bloggers to go out and cover stories and get original content. He also provided an alternative suggestion (that he often exemplifies) to provide a great deal of squib style capsule references to stories posted on other blogs. The folks at the May 29, event observed that it seems that Reynolds (somehow) reads a phenomenal (all?) amount of other blogs to supply his readers with pithy comments and links. What Reynolds does, works because one panelist reported that a plug from the Instapundit boosted his, Roger Simon’s, all time high best from the previous 300 to 3,000. It did seem like the discussion at the 2004 Memorial Day weekend event wandered “off topic” repeatedly. There was a lot of “blah, blah, blah” going on. Perhaps they should call it blahging? There is a tradition of staging an “event” in class at Journalism schools and then having the students write up their report and comparing the results. The various reports by the “witnesses,” often differ greatly on specifics such as what the “perpetrator” was wearing and what his (or her) physical description was. In the future, will there be a print magazine for those interested in blogging? Carnac isn’t doing his magic act these days so we can’t ask him, but our guess is that maybe 10 or 15 years from now, such a product will be available at your local newsstand. There is a wealth of material about “The Inside Story: Hollywood and the Media Deconstructed” held at the American Cinema Foundation on May 29, 2004. Could someone do a doctoral thesis in communications (or some such) with all the material available? Well, it seems there is a wealth of material to sift through. Some of the sites we linked to will, in turn, link to other sites (that we may have inadvertently missed) which will have more details about this particular event. This Little Green Footballs link should take our readers right to their story of the event. Meanwhile back at L.A. Observed the comments were many, subsequently. Perspective? On June 1, 2004, two days after the L.A. event, in Australia the Sydney Morning Herald was remarking on the wonderful weather and deciding what the meaning of “the beginning of winter” really is. If an event happens and it isn’t reported in the New York Times, does it make a sound? Not to worry, there was a fellow there who (allegedly) was working on a story for the Sunday magazine section of that (allegedly) prestigious publication. The panel moderator also blogged her take. Other online reports are available. Here and here. Bloggers can turn you on to some really weird stuff that you don’t get in the mainstream media such as conspiracy theories about the Berg affair. The blogging phenomenon is just getting started. It may be too early to evaluate its impact on other media, but it is this columnist’s contention that it is never too early to start chronicling the history of an evolving new style of communication. Did Sir Winston Churchill provide the bloggers motto (Bartlett’s 16 edition page 621 no. 4) when he said: “Nothing is more dangerous in wartime than to live in the temperamental atmosphere of a Gallup Poll, always feeling one’s pulse and taking one’s temperature.”? The 1957 hit The Flying Saucer by Buchanan and Goodman set a historic president for modern recordings that use “sampling.” So, if the disk jockey will put that on, we’ll disappear in a flash over the horizon hoping that we will return next week with a historic installment of The World’s Laziest Journalist. Until then, have a sci-fi week. P.S. did we say how suave and debonair Glenn Reynolds was at that 2002 event? Bob was born and raised in Scranton, Pennsylvania. Graduated from the University of Scranton in . . . make that "way back when." He has worked as a reporter and photographer for daily newspapers in California, Nevada, and Pennsylvania. During the "way back when" phase of his life. Did photo stringing for the AP’s Los Angeles bureau in the seventies. Has done some freelance work. Held other jobs to pay the rent and provide meals money. Has written book and movie reviews, and columns for Delusions of Adequacy online magazine for the last four years. Recently the DOA management reportedly traded him to the Just Above Sunset online magazine team for an undisclosed sum and two future draft choices. He is known to be in the LA area and is considered dangerous. If you see him, call for backup before attempting to get his autograph or some such fanboy nonsense.